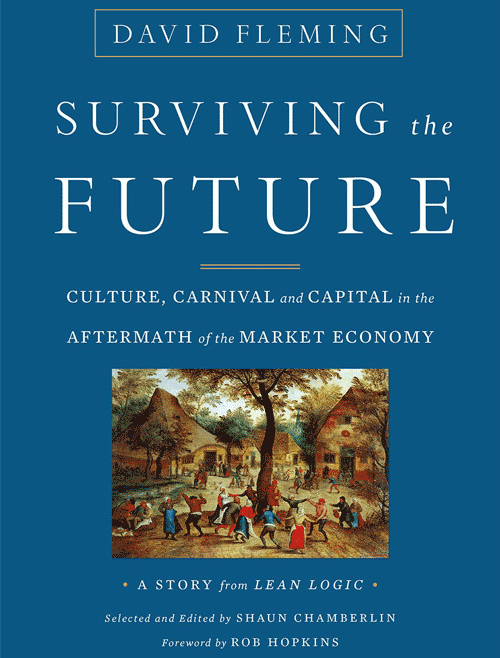 This is a selected extract from Surviving the Future: Culture, Carnival and Capital in the Aftermath of the Market Economy for our Future of Work issue. David Fleming believed that the market economy will not survive its inherent flaws beyond the early decades of this century, and talks here about “building the sequel, drawing on inspiration which has lain dormant, like the seed beneath the snow”. It is a truth universally acknowledged that competitiveness is a good thing. It is a life-saver, in that it enables an economy to pay its way. It is a provider of equity, in that it enables people to achieve wealth and status on their own merits. And it is the only way in which a price-based market economy will work. But it comes at a cost. A competitive market economy must, by definition, be “taut”. The price charged by Fred for his goods will hold only so long as the price charged by Dan for the same goods, in the same place, is no lower. If it is, Fred will need to reduce his prices, or else to go out of business. Prices for goods therefore tend to converge to the same level. And that level requires all the producers in the market to be efficient – to work full-time, to use the methods that cost least, and to sell as much as they can. Producers all understand this necessity – there is little choice in the matter; what distinguishes them is how good they are at doing it. There is a requirement to innovate, because the competitive market is taut: everyone else is doing so, and anyone who does not is quickly priced out of business. In the future, it will not be like that. Producers will not always want to provide their goods and services in the most efficient way. They may – for good local reasons – want to use a technology which is more expensive. For instance, it could make sense, from the point of view of the resilient community, to use less energy, water or material, at the cost of having to spend more on labour. Or local craftsmen may be able to keep up with local demand for long-lasting goods despite working for only three days a week. Or producers may simply decide not to produce the maximum quantity, and to take it easy and produce according to what they see as reasonable need, or what they have the time for, after spending time with family and neighbours. All these choices would have the effect of raising the price of the goods supplied by that producer or – if other producers did the same – by the community as a whole. In a taut market, such decisions could not be made. If they were, they would not stick, because a producer that tried to do so would be quickly put out of business by others who went for the cheaper option, the efficient and competitive one. Any market that did manage to make such sensible, yet inefficient, decisions stick, would be slack – and it would be at constant risk of being stymied by competitive producers seizing the opportunity to make easy money by producing and selling at a lower price. How can a community, despite all this, be mistress of its own fate in this sense? How can it sustain that condition of slack – that is, have the freedom to make enlightened decisions and make them stick? Well, here is the good news. The “normal” state of affairs, before the era of the great civic societies, and in the intervals between them, has consisted of political economies – perhaps better known in this case as villages – where the terms on which goods and services were exchanged were not based on price. Instead, they were built around a complex culture of arrangements – obligations, loyalties, collaborations – which express the nature and priorities of the community and the network of relationships and reciprocities between its members. No, don’t scoff. This is what households still do – and friends, neighbours, cricket teams, magistrates, parent-teacher associations, allotment holders; this is the non-monetary ‘informal economy’, the central core that enables our society to exist. It is outrageous to the received values of now: it is not transparent; it is nonconformist; social mobility in it is limited; it is neither efficient nor competitive; it is full of anomalies. But it keeps things going. So, back to the question: how do communities manage to keep such an apparently unstable economy going? Well, it turns on culture. Sheer naked loyalties and family values can only go so far. There needs to be something interesting, connecting, going on too – something to talk about, to cooperate in, to mull over, to aim for, to laugh at; there needs to be a story to tell, something to coordinate and to do together. A culture is like the upright strands that you begin with in basket-making, round which you wind the texture of the basket itself: no sticks, no basket; no culture, no community. It is the context, the story, that identifies a community and gives it existence. It is both the parent and child of ‘social capital’. And the social capital of a community is its social life – the links of cooperation and friendship between its members. It is the common culture and ceremony, the good faith, civility and citizenship, the play, humour and conversation which make a living community, the cooperation that builds its institutions. It is the social ecosystem in which a culture lives. Ever since Adam Smith observed that people are willing to carry out almost any service for each other despite being motivated by nothing more than commercial self-interest, it has seemed to be unnecessary and ridiculous to suppose that there is any significant role for such higher motives as benevolence. Economists simply haven’t needed such concepts. Well, they do now. The economics of the future will be benignly and inextricably entangled with social capital – with intense links of reciprocity – in comparison with which the reduction of economic and social relations to the piteous simplicities of prices is not up to standard any longer, and is due for retirement. It is now all right to speak of benevolence as an economic concept, for economics is at the early stages of being reintegrated into community, and community into the whole nature of the living things that belong there. It will not be from the impersonal price-calculations of the butcher, the brewer or the baker that we expect our dinner, but from the reciprocal obligations that join a community together, and the benevolence among its members. Slack is the space in which judgment lies. The early shocks of descent may leave little room for choice: just one tolerable option could be a fine thing, and that may be as much as most of us can hope for, at least for the time being. In the mature settlements that could follow, however, the tyranny of decisions being made in lock-step with competitive pricing will be an ancient memory. There will be time for music. An intentionally slack market may make a deliberate collective decision to build and sustain a locally-based economy with a much lower level of output and consumption than it could produce if it were taut and competitive. Maintaining this requires that work is shared out; that the inefficient technology is freely chosen; that nature is spared. Such a settlement is the core principle of post-market economics, but it is quite fragile – like our planet Gaia herself. On a small scale, intentional slack can be done easily enough. For example, the informal economy of the domestic household is prodigal with labour, and if it had to compete on price it wouldn’t have a chance: such inefficiencies would be wiped out in a moment. It works because price is nothing to do with it, and it is this kind of essential-yet-slack economy which holds out to us the possibility of a future. But the household is protected by having opted-out from the competitive market, and it is not easy to sustain such agreements at the large scale. Nonetheless, most human societies in the past, outside the taut, tense experience of urban civilisation, have been slack in this sense, relying on things that are anathema to a competitive economy: local loyalties and currencies, collusion and cartel, culture, and confidence that it knows what it wants and where it is going – that it can choose how to live. The medieval calendar was filled with holidays. Official – that is, church – holidays included not only long “vacations” at Christmas, Easter and midsummer but also numerous saints’ and rest days. These were spent both in sober churchgoing and in feasting, drinking and merrymaking. In addition to official celebrations, there were often weeks’ worth of ales – to mark important life events (bride ales or wake ales) as well as less momentous occasions (scot ale, lamb ale and hock ale). All told, holiday leisure time in medieval England took up probably about one third of the year. And the English were apparently working harder than their neighbours. The ancien régime in France is reported to have guaranteed fifty-two Sundays, ninety rest days, and thirty-eight holidays. In Spain, travellers noted that holidays totalled five months per year. It was backed up by a well-established ritual year, and when the rituals came abruptly to an end in the Reformation, the feast day slack was stopped too; in England by the Act of 1536, which allowed itself a rant at those who ought to be at work “being enticed by the licentious vacation and liberty of these holidays”. A strong culture that can support slack has been in retreat ever since. But the inconvenient truth is that, as the economy now begins to decompose, we have to rebuild a slack society to take its place. The opening up of choice, not least choice in the use of time, allows the economy to be interesting in a way which is impossible if it has to make money with nearly everything it does. And yet, in a competitive market economy, a large amount of roughly-equally-shared leisure time – say, a three-day working week, or less – is hard to sustain, because any individuals who decide to instead work a full week can produce for a lower price (by working longer hours than the competition they can produce a greater quantity of goods and services, and thus earn the same wage by selling each one more cheaply). These more competitive people would then be fully employed, and would put the more leisurely out of business completely. This is what puts the grim into reality. There would then be excess labour, and wages would collapse to zero. In other words, the slack economy is unstable – it could at any time snap back to taut, full-time competitive employment for some (for a time), along with destitution for the rest. Consider, for example, this following thought-experiment. 1. They are consuming the maximum they want to consume: if they had more money, they would not increase their consumption. 2. They never believe each other’s promises. 3. There are no unemployment benefits, so that the out-of-work die. Now imagine that this miniature economy abruptly experiences a shock: there is a technological advance that doubles productivity, so that the 100 workers now produce twice as much as they did before, but consumers (by assumption) do not consume more, so overall consumption remains unchanged. What happens? Well, the doubled productivity means that now only 50 people are needed to produce enough for 100, so half the workforce becomes unemployed. There are no unemployment benefits, so they die. Now, if they were sensible, they would all decide to work half-time. That would give them the same quantity of goods as they would get if half of them worked full-time, and it would share out the leisure. But they do not do that because they can’t get an agreement to stick; they are conditioned by the market economy; they have to be competitive, and cannot forgo an immediate advantage from which they would individually benefit in favour of a future (and larger) advantage from which everyone would benefit. Competition now becomes a curse, frustrating all efforts at accommodation, but people are programmed to think only in those reductive terms. And that has particularly regrettable consequences if they are in a system which, when it is stressed, can become unstable. Thus, George realises that if he works half-time, Jack can steal a march on him and work full-time, earning twice the money, selling his product at half price, and putting George out of business. Every­one is scared of opportunists like Jack, and they blame each other for “forcing” them to behave in this way; they dare not trust each other, so they cannot take the simple step needed to solve their problem and enjoy leisurely lives (this is a version of the “Prisoner’s Dilemma”, see box). When you can’t trust people to choose what is best for everyone. The Prisoner’s Dilemma is an allegory (told in many different versions) of two suspects that are being separately questioned about a crime which, in reality, they committed together. If they both deny it, then (since there is no proof) they will be allowed to go free. However, denying it is quite risky for both of them because if (say) George denies it and Jack confesses, George will be shot (and Jack will only get a ten-year prison sentence, as a reward for pleading guilty). They cannot talk to each other, nor trust each other to deny the crime, so they both end up confessing it and going to prison. If only they could have trusted each other, they would both have been let off. The problem is that the ideal solution is ruled out as suicidal unless some special reassurance – a binding declaration of honour among thieves – had been made in advance. It would have had to be quite a performance – an oath of undying loyalty, not just a fix-up in the pub. This is why it is difficult to sustain a part-time, slack economy. There are obvious practical reasons too: it would be hard for pianists, brain surgeons, tennis champions and others with skilled jobs to maintain the standard they need if they only worked part-time; and challenging to monitor the working hours of the self-employed, such as writers, who work at home. Unannounced visits by time-wardens might be viewed with concern and would anyway be less than fair, since the working hours of the less-skilled jobs (e.g. waiters) could more easily be monitored than the more-skilled ones (e.g. philosophers). But the deeper problem is that agreements on self-denying measures – such as shorter working time, or a deliberately inefficient technology, both of which require people to forgo immediate advantage – are hard to sustain. Everyone who stays within the limit, forgoing the opportunity to be more competitive, is a potential sucker. That is the core, enduring ethic of the market. First, the aim is not, in essence, to reduce working hours; it is to build the informal and local economy to the point that it meets the wants and needs which the declining market is conspicuously unable to provide. Indeed, the whole discussion of work and leisure makes more sense when it starts with the aim of increasing working time in the informal economy, rather than of reducing working time in the formal economy, which is on course to decline whether we want it to or not. Secondly, the post-market economy will be fully aware that there are other ways of inhibiting economic growth: the use of labour-intensive methods, the selection of technologies for their minimal environmental impact rather than for their productivity, the discarding of surpluses and various other strategies within the range of options open to the slack economy. It is unlikely that they will be needed to end the growth of the formal economy, but they will certainly be applied in the informal economy of the future. Thirdly, as discussed in previous chapters, the post-market economy will again be built on a strong culture and on social capital, underwriting a shared sense of common purpose and enabling it to make decisions that stick: it can sustain desirable aims such as more leisure time if it needs to do so. …at least, in principle. But the instability never goes away. Still, it is a core aim of post-market economics to keep its choices and arrangements from unravelling, to restore to human society the power of decision, instead of being subject to the turbulence of competition and the opportunism of price. A decision to work shorter hours, the use of labour-intensive methods that can be done lovingly and in a closed-loop system – these freedoms are waiting to be rediscovered. There are snags, of course. Living in a slack economy, supported by the culture rather than by opportunism, is a skilled task. Many of the abilities needed for it are best learned in childhood. The potential for play, judgment, imagination and manners must be activated early in life if they are to develop properly, but the narrow targets-based education of the market economy passes them by. This means that more leisure could short-circuit miserably into poverty and resentment. Or it could be sucked up by addiction to television and its related media, through which the time available to make a personal commitment to social capital or to a new political-economic order is diminished. 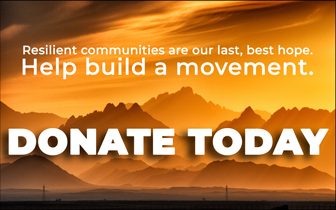 Having to build society anew from its very foundations is a challenge. When the builders don’t turn up, the challenge is greater. The other major snag is that the advanced technologies may not be available. And yet, the possibility of a culture-rich, technically-advanced, sustainable economy, with the key accomplishment of slack – with time to think – is there. This extract offers a taster from the late David Fleming’s remarkable Surviving the Future: Culture, Carnival and Capital in the Aftermath of the Market Economy, published by Chelsea Green Publishing, September 2016. You can buy it here.